Welcome to StoneGable. I thought I would let you in the front door of my life and home today. Most of my friends come in through the back door or the (eek!) garage. 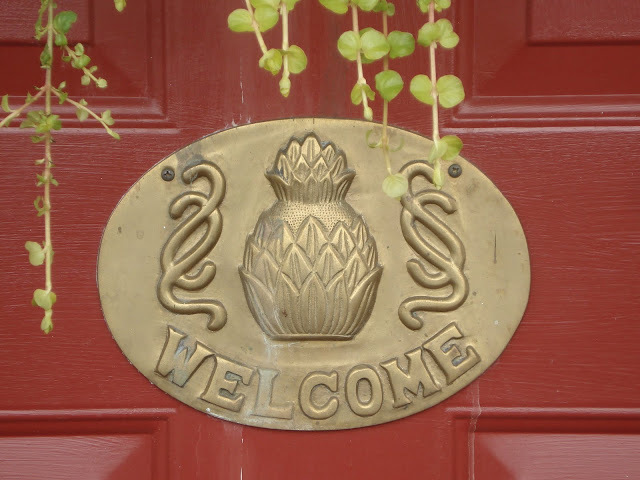 Since this is the first day of my blogging history, I want to give you a warm and formal welcome…through my front door. So come on in, and visit with me for awhile, new friend. 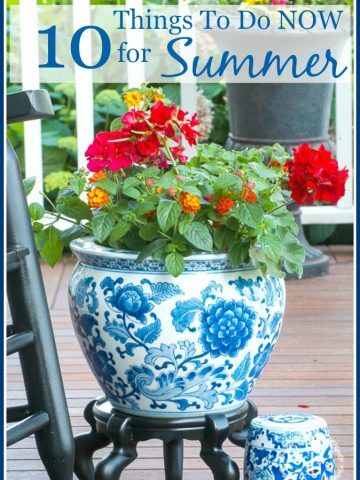 Each summer I plan a different theme for my front door and surrounding porch. Last year, it was “wedding bliss” to commemorate the wedding of my daughter Jacqueline to her prince charming, Jonathan. Flowers of white, ivory and blush pink spilled over pots in a rememberance of Jacqueline and her lovely bridesmaids. 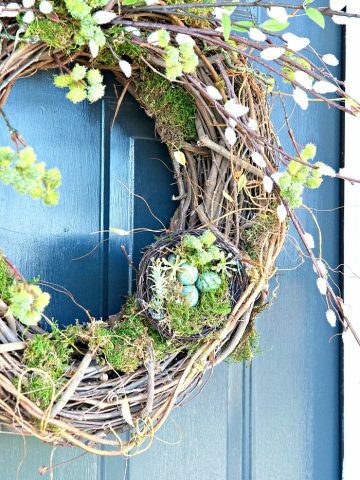 A large wreath I had made for the church door graced my front door all summer and every time opened it I was flooded with wonderful memories and happy tears. 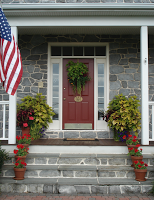 In years past I have donned my porch to honor our military (when my son enlisted in the Army), pay tribute to baseball, give a salute to patriotism or celebrate the lazy days of summer. All year long I make a list of possible summer themes. And take pictures of places that inspire me. Files of torn magazine pages filled with wonderful ideas are stashed away for future inspiration and interpretation. Events of the past or upcoming year weigh in heavily as I decide on a theme. But this year I decided to create what I call- PROFUSION. Unfortunately, I really can’t tell you why I chose this theme. I just wanted something BIG. Yearning for a cacophony of different colors and shapes with nothing too matchy-matchy gave me a foundation for my plan . I wanted big leaves that made a casual statement, an off-handed, devil-may-care look that had a big punch even from the road. 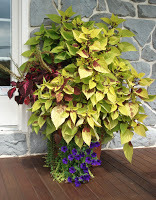 What started as small plantings of many different flowers, ended up in continual flux as one flower bloomed and another faded and the coleus eventually overtook most of the less pushy and delicate plants. It’s hard to tell in these pictures, but there is no rhyme or reason to the color scheme or the plants I chose. I just liked them and did not care that they might not “go together”. 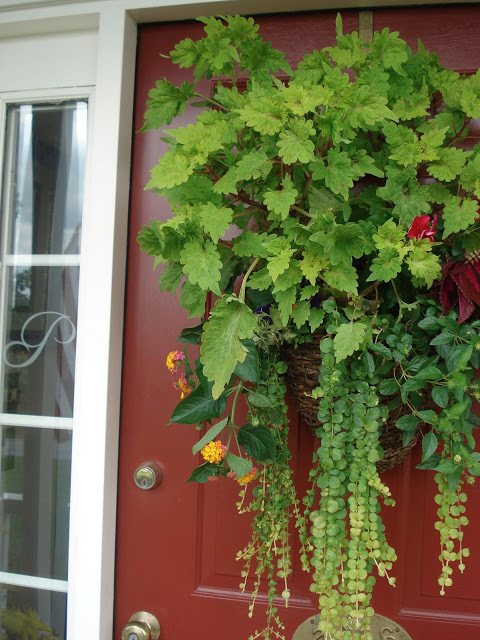 The basket on my front door was a great surprise to me. It has a mind all of it’s own! I had planned for more flowers and less foliage here, but letting nature take it’s course yielded a pleasant result after all. 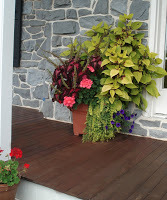 Many of the flowering plants we covered up by the coleus. During a springtime trip to Savannah I was inspired by embossed Monograms in the windows of some historic residences. ( By the way, I love, love, love Savannah! It was like finding the Mother Ship!!!!) So, thanks to Uppercase Living, I gave my front door window a little make-over. 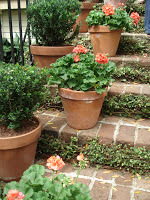 I was also enamoured with front steps bordered by pots of geranium at the Magnolia House (Savannah) and knew I wanted to do the same at StoneGable. I will probably incorporate them into my planting themes for years to come. Unfortunately, I cannot grow the beautiful ground cover that grows horizontally because of my climate. I am still thinking about ways to interpret that look. As StoneGable changes with the seasons, so the seasons of my life are changing. I embrace change, because I cannot stop it. I am where I am supposed to be… and I hope you are, too. Stop in and visit as I chronicle my domestic adventures and antics… you are always WELCOME. Love your site. So inspirational, in more ways than one. I’ve been wanting to put our family initial on our side windows like yours, for a long time now. Can you give me pointers on what you did. Gosh, I did this years ago. I think I ordered them online! Sorry I can’t help you more. I love going back to the beginning of people’s blogs. So much fun seeing how much it has grown! I am so very glad you decided to enter the blogosphere, Yvonne! 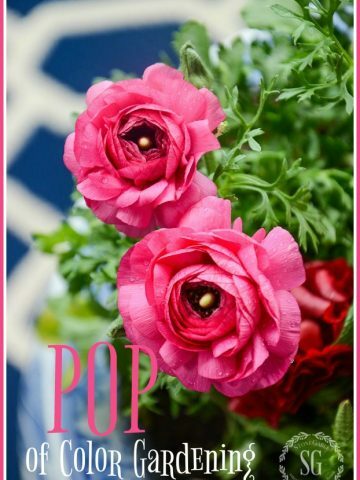 You’re presence has added such lovely inspiration to the blogging world. Oh my goodness. There are so many different sections to go to that I’ve been hopping from one to another. I have now decided to start at the first and slow down a bit and really enjoy everything you have. Perhaps I better start with adding my picture. Hello from Texas, Yvonne! I love the front door basket! 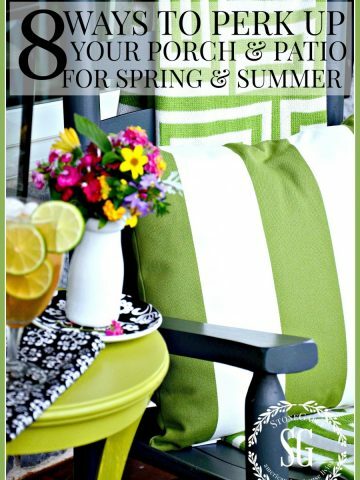 I’m looking for ideas to make one for my daughter’s new house and stumbled upon your blog. I’ll be back again to see what you’re up to 🙂 Also, the breadstick cinnamon buns look yummy! Thanks for blogging! Your blog is real beautiful. I’ll come back later, with pleasure. Au plaisir de la découverte! Your home looks magnificent! When I started looking at your blog, I thought maybe it was a B&B. Does your family sit at the beautiful tables you set? I hope so. So impressive! Welcome to blogging. I hope you enjoy it as much as I. I would love for you to join me for Crock Pot Wednesday at diningwithdebbie.blogspot.com. We are all about good time, great food and ease of preparation. Come shar your ideas and words of wisdom.